Even in a stagnant economy, people are still supporting what they value, and many nonprofit arts organizations report that contributions remain strong. With all the robust signs of life in American orchestras, I thought I’d have conversations with the heads of marketing for the two polls of the continent’s orchestras. Both the New York Philharmonic and the Los Angeles Philharmonic have opened new seasons that also debut the régimes of exciting young music directors. 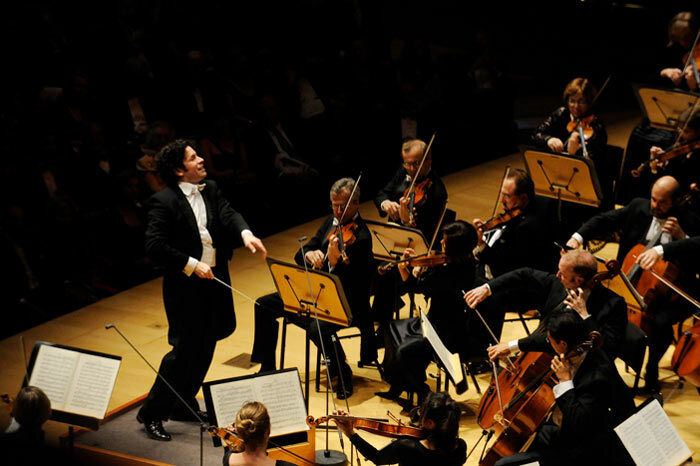 On the right, we have a local boy who grew up with the orchestra, Alan Gilbert, while the left coast welcomes Gustavo Dudamel from the hotbed of lively, youthful music that Venezuela has become. At the NYPO, David Snead, Vice President, Marketing, is clear that innovation and creativity are employed for a reason and that, for thirty years his reason has been the same: “turning people onto the music.” The best way to get exciting and excited new audiences, he has proved, is not to offer them dinner or preferred parking but to offer them exciting music in a way that projects its inherent nature and excitement. What he calls his “epiphany” came when the twenty-something daughter of a friend visited him in New York. She asked Snead if he would take her to a rock concert. He was a little taken aback that she wanted to trek out to Farmingdale, Long Island to hear Duncan Sheik — on what was for him a “school night.” This was before the Broadway hit, Spring Awakening, and her host was not really sure just who Duncan Shiek was but consented — stipulating that he must be in bed by 11. His visitor also asked Snead to bring his camera to take her picture with the artist. He took this to be an instance of naïveté of the ways of concert life, since he knew her chances of getting that close to a rock star would be slim indeed, and he certainly didn’t want to have his camera confiscated, as he knew to be the practice when a guy showed up at a concert hall with the conspicuous intention of taking photos. Not only did the young woman — and many others of the audience — get an individual photo with Duncan Sheik; not only did he find himself falling into bed at 4 a.m.; but next morning he learned that his guest, far from retiring in contented exhaustion, joined hundreds of other enthusiasts online to discuss what they had heard at the concert. There they not only shared their pictures from the event but dealt with a minority complaint that there had been too many slow songs. Snead was thunderstruck to learn that Duncan Sheik had then appeared online as well, where he defended his programming. All this had been an integral part of the event, so far as the fans were concerned. That’s when Snead thought, “Here we are in New York. Manny Ax and Gil Shaham live in New York, and they’re very open guys with a great attitude towards the public. Why can’t people hungry for musical fellowship be provided with more access to them and other towering artists than just seeing and hearing them on the concert platform?” One result of this question has been a whole program of engaging interviews with a performer or composer for each event — at least one per concert — pasted on the orchestra’s Web site. These seem to have greatly decreased the sense of perceived distance between audience members and the musicians that they go to hear. In addition, the site also provides downloads of music from the Philharmonic’s internal label, along with access to more material via iTunes and mobile phones. The free concerts in New York’s public parks, already favorite summer events for large crowds, came to yield an increasingly participatory experience through devices like the two-season-old practice of inviting audience members to contend via mobile phone on behalf of different encore alternatives. At least as invigorating for these events have been the online photo contests, for which pictures of the event taken by audience members are submitted to the site and prizes are awarded for various categories of views from the evening. These have without doubt represented a significant change of emphasis from the stage to the audience experience of the music emanating from that stage. Thank you, Duncan Sheik and young woman visiting from out of town! “We’re a learning organization,” the thoughtful Philharmonic marketer tells us. This presupposes a vision far different from the idea of marketing as dictating the experience that the public is expected to take — or leave. Snead seems to feel that the most compelling “brand” is created by the consumer rather than by the management. A fruitful result and evidence of this is the enormously successful Create Your Own Series subscription program. This has been a powerful way for younger audiences to form the conditions of their participation in the season for themselves, while at the same time communicating some useful information to the management. Naysayers had predicted that people allowed to design their own series would make a rush for the most popular familiar repertory, leaving the more challenging (read: “unpopular”) evenings comparatively deserted. The facts have been quite otherwise. The Philharmonic has balanced the time invested in learning about their audience with much effort at communicating with that audience about the thrill of discovery available to those who engage with new musical experiences at the highest level. Those who customize their own subscription have renewed at the stunning rate of 90%. What’s more, they are trading up in number of concerts and to better seats — clear evidence that they value the experience that they are getting and want to enhance it further. Thus the organization sees increases in customer satisfaction, longevity as subscribers, and motivation to become donors. Another sign of satisfaction is that, when they are given discounts for various reasons, statistics show that these are overwhelmingly inclined to use the saving for … wait for it: more concert tickets. All these programs, their devising, thinking-through, execution, supervision, and — crucially — their evaluation are expensive in thought and staff hours. But, in money, the entire online multi-media program, for example, costs for a whole year approximately what a quarter-page ad in the leading metropolitan daily costs. These kinds of comparisons command attention. An hour of conversation with David Snead was succeeded by an hour engaged with Shana Mathur, who is Vice President, Marketing and Communications at the Los Angeles Philharmonic. After what I had heard about consumer-designed experiences, I was eager to know how the Create Your Own Season program was prospering on the other end of the continent. Evidently we’d have to say that it’s a success when participants in the program have doubled from last season to this. If we remember that this was hardly a limping organization before, such response from the public must be respected — and examined. Naturally the popular fervor that the arrival of a new music director has inspired makes people want to see him, if nothing else. But people are buying not just Dudamel concerts. There is a clear age difference between the modes of subscription: the average age of fixed subscribers is 65, whereas that of Create Your Own is ten years younger. “It takes a lot of 30-year-olds to bring it down that much,” Mathur points out. While these, not surprisingly, flock to the visits of the Berlin Philharmonic, John Williams, or Steve Martin, there also seems to be no letup in the willingness to buy tickets for the non-familiar and adventurous — a legacy of 17 years of steady progress in this direction under Esa-Pekka Salonen. The Los Angeles administration is particularly alert to lifestyle issues as they reflect and affect participation in the seasons. Since the prosperity of the Philharmonic had long been subscription-driven, when Mathur joined in January of 2008, she realized that this round hole, while wonderfully effective in its way, wasn’t quite right for a lot of square pegs who needed to be reached out to. She recognized her good fortune in having two iconic venues that in themselves drive audience interest (the Walt Disney Concert Hall and the Hollywood Bowl), each with a distinct season. She found “a well-oiled machine” in place that she was wise enough to respect. “I didn’t want to stick my foot in a wheel that was running smoothly.” On the other hand, there was no digital team in place, and it seemed an obvious step to create a department of digital marketing. One result of this was a growth in the extent and effectiveness of the e-mail list. Mathur saw the digital realm as providing greater opportunities for engagement. When the idea of online games came up in internal discussion, she said, “We have an opportunity to have lots of fun here. Let’s just do it.” The resulting games have been an “incredible hit.” One of them introduces “what a conductor does.” It thus teaches nuts and bolts relative to experiencing the Philharmonic, but it also incites commentary and brings new audiences closer to what goes on at the concert venues. She sees the games as a way to involve and engage audiences. Web analytics are also key. How did the user get to that video? A link in an e-mail or on the site of an educational institution? That will inform what they buy. How does a print ad or an ad on a newspaper’s Web site get the user to a point of purchase? Her staff also created mobile programs so people could text in their photos to a “What Happened Last Night” feature after a Hollywood Bowl evening. The increased return-visitorship has persuaded them that to implement a program tailored for the Walt Disney Concert Hall as well. The team’s creative thinking was guided by the perception that subscription is a luxury — not so much financially as in presupposing a well-regulated schedule and more or less predictable habits and needs. This corresponds, of course, to the secure and settled retired person — which helps explain the age difference in modes of purchase. On the other hand, they look closely at other lifestyle needs: for example the two-career young marrieds-with-children for whom planning ahead may be the only chance for a night out at the Philharmonic as a couple, with babysitting engaged and demanding work schedules arranged. The relationship between marketing and artistic administration at the LA Philharmonic is highly collaborative. The artistic side typically comes to marketing with ideas, and the many successful festivals that the organization is known for are necessarily cross-departmental initiatives, since a festival is among other things a marketing package. Festivals like their “West Coast/Left Coast” (in which California was celebrated as the home of progressive ideas in music and society) involve marketing from the very beginning.